With Indonesia's long history as a land of spices, it seems only natural that the local food - even the cheap but filling stuff sold on the streets - fuses local ingredients and traditional cooking styles into a tasty, thrilling whole. Indonesia's history as a battleground and colony for Portugal and Indonesia actually revolves around the spices originally cultivated around the nation's many islands. “A bloody war was fought on spices in the archipelago almost half a millennium ago," explains K.F. Seetoh, TV host, founder of Asian food company Makansutra, and chief exponent of the upcoming World Street Food Congress to be held in Singapore. "Can you imagine what they were doing with these spices, with food, that makes people want to kill for it?" No worries, the situation has calmed down somewhat: today, visitors to Indonesia can now eat their favorite street foods in peace. If you're in a city like Jakarta or Yogyakarta, chances are you don't need to walk very far to find any of the street foods listed in the next few pages. Many of these foods are popular throughout Indonesia, with a few local favorites for good measure. Indonesia's 230 million people are divided between 300-plus ethnic groups; the Betawi ethnic group claim Jakarta as their own. The Betawi culture is responsible for a large part of Jakarta's street food scene, including nasi uduk and Betawi variants on soto and gado-gado. Kerak telor (Bahasa for "egg crust") is the signature Betawi street food: a glutinous rice frittata cooked over charcoal by itinerant vendors. The vendor places a small portion of sticky rice in a pan, then adds fried shallots, shrimp, grated coconut, pepper and salt. The whole ensemble is then mixed with either duck or chicken egg, then served hot on top of paper. The exterior is cooked to crispness, which explains the name. Chicken or duck egg? It depends on your taste; the duck egg contributes a richer, fattier taste and mouth-feel, although kerak telor made with duck egg costs a little bit more. The dish bears a passing resemblance to an omelette, but the addition of the sticky rice, shallots, shrimp, and coconut (not to mention the Indonesian spices) sets it apart completely from its bland, un-crispy Western cousin. Kerak telor is not as ubiquitous as its fellow street foods: "We prefer to sell it only in certain spots that are iconic to Jakarta, like Monas, Old Town and Setu Babakan," explains Bang Toing, a Betawi kerak telor seller based in Jakarta. "I’m not really sure why, but that’s just how we do it." Image courtesy of Makansutra, used with permission. This coconut-infused rice bears a passing resemblance to the nasi lemak you'll find in Malaysia, but the Betawi have made nasi uduk uniquely their own. When cooking nasi uduk, Betawi substitute coconut milk for water and incorporate lemongrass, clove and other spices. This results in a creamier, more savory rice that pairs especially well with tempeh, nasi ayam or anchovies. "Soto" is the catch-all phrase used for Indonesian-style soup, and comes in a multiplicity of regional variations. Soto tangkar is a Betawi take on soto: beef ribs and brisket stewed in coconut milk, garlic, chili, candlenut, and other spices. The Betawi like to serve soto tangkar alongside saté daging sapi (beef satay): diners use the soto tangkar as a spicy dipping sauce for the roast beef skewers. Soto's noble roots belie its present street cred: the Malaysian food blog Fried Chillies explains that the name soto has its roots in the Malay word ratu ("royal"), the same root for the Malay word for "palace", kraton (ke-ratu-an, corrupted into kraton, see Yogyakarta Kraton). As Fried Chillies tells it, a King fell ill and asked for a restorative soup. The soup was made spicier than usual for the benefit of the king's illness-numbed taste buds. The resulting dish was called suap ratu ("fed to the king"); the name was eventually corrupted over time into soto. Vegetarians can breathe a sigh of relief: they can still enjoy Indonesian street food by ordering the salad known as gado-gado. The name literally translates to "mix-mix"; after all, the dish is a mixture of blanched and fresh vegetables, tofu, and tempeh, bathed in a peanut-based sauce. The dish can be garnished with hard-boiled egg slices and sautéed onions, and served with a side dish of kripik (deep-fried, starchy crackers). Unlike most other Indonesian street foods, gado-gado has easily crossed over into restaurants and hotels throughout the region; the salad is a regular mainstay in Singapore's hawker centers and some of Indonesia's posher dining places. Another (usually) meat-free street food, ketoprak resembles gado-gado in its use of peanut sauce as a dressing. The difference lies in ketoprak's use of rice noodles and lontong, a form of compressed rice. Bean sprouts, chili, garlic, tofu, shallots, and kripik complete the ensemble, with some stalls adding hard-boiled eggs and cucumber slices. Food lore has it that ketoprak originated as a traditional dish in Cirebon, West Java. Today, ketoprak is considered a Betawi/native Jakarta staple, although you'll find this street food in Yogyakarta, too. When ordering ketoprak, you can specify how spicy you want your portion to be; the sellers tend to prepare each serving individually. Nasi Gila - Go Nuts Over Jakarta's "Crazy Rice"
"Gila" means "crazy" in Indonesian, so "nasi gila" translates to "crazy rice"; the name refers to the hodge-podge of sausage, chicken, meatballs, and lamb ladled liberally over white rice and garnished with a handful of kripik. Visitors to Jakarta's genteel Menteng district (home to President Obama when he was still living in Indonesia) can drop by after dark to sit at a plastic table and chair and tuck into the stuff, washed down with teh botol (cold tea bottled up like a softdrink). Nasi gila is just one of Jakarta's many street-food rice preparations; the capital city's workers love to tuck into fried rice (nasi goreng) dishes with descriptive names. The Jakarta Globe reports on a few local variants, including "nasi goreng ganja - so named because of its alleged addictive quality" and the "mawud nasi goreng sold by vendors on Jalan Haji Lebar in Meruya, West Jakarta... Mawud is a play on the word maut, meaning lethal or the hour of death." Bakso is a major player in the Indonesian street food scene: a delicious, hearty, and cheap source of protein served from pushcarts. The meatballs vary in size from golf-ball to tennis-ball humongous (the latter are aptly called bakso bola tenis - the meatballs have hard-boiled eggs in the middle). These springy balls of mystery meat are mixed with noodles and a hearty broth, then garnished with fried shallots, hardboiled egg, and bok choy. Richer regional variants add wontons, the Chinese dumplings known as siomay (siu mai), and tofu. To add kick to the dish, diners generally eat bakso with a side of sambal, or Indonesian chili paste. If you simply can't appreciate food unless it's fifty percent habanero peppers, then you'll feel right at home in the eastern Indonesian city of Manado: the local Minahasa ethnic group eats everything with chilies. And we mean everything - the Minahasa even dip their bananas in chili paste! Which is not to say that Manado cuisine is all about starting five-alarm fires in your mouth; Minahasa cooks love to enhance their dishes with fragrant herbs like basil, lemongrass, and kaffir lime leaf. 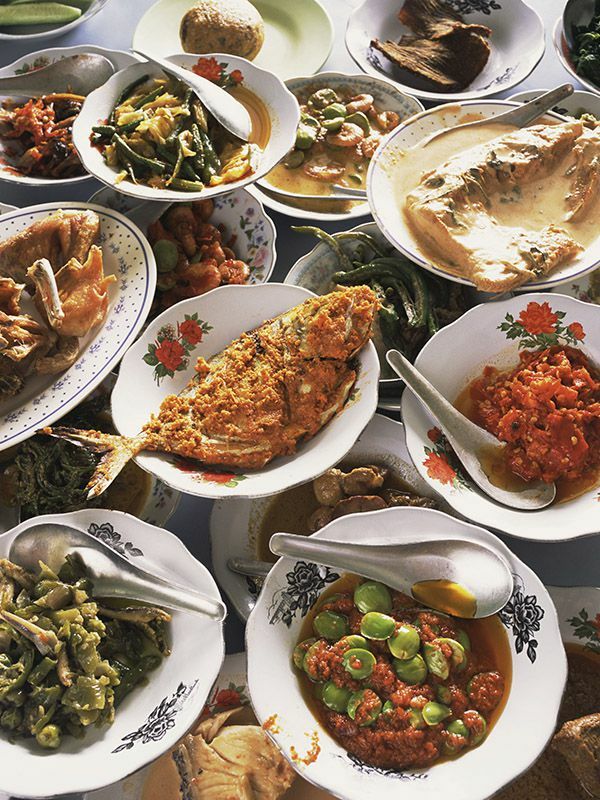 The foods in this image bear all the unmistakable signs of Manado food's heat and fragrance. A mound of white rice (nasi) sits in the middle; on the upper left, there's cakalang rica-rica ("cakalang" is skipjack tuna, a staple meat in seaside Manado; "rica-rica" refers to a red chili that the Minahasa love to stir-fry with their protein). Partly covering the cakalang on the lower left, you'll see a large patty of bakwan jagung (corn fritters). Rounding up the plate are rica rodo (a vegetable dish of stir-fried corn, eggplant, chili and belinjo leaves) and a skewer of pork saté. Bananas in chili paste? Only the chili-crazy Minahasa of Indonesia's North Sulawesi province could come up with a street food so unlikely, but so delicious at the same time! In Manado, you can pick up pisang roa to snack on at most street stands around the city. "Pisang" refers to the starchy bananas that find their way into many Southeast Asian snacks and desserts; "roa" refers to the smoked fish that the Minahasa stir-fry with chili, garlic, and tomatoes into a condiment called sambal roa. A portion of pisang roa includes one or two newly-fried bananas and a shallow bowl filled with sambal roa; you're supposed to dip the banana into the sambal with every bite. The Minahasa love their sambal, and have developed a repertoire of chili pastes that go into almost every dish they make. Other famous sambal from the area include sambal dabu-dabu (a sambal made from fresh chili, shallots and tomatoes) and sambal rica-rica (a chili dish made of fresh red chilies stir-fried with fish or other meats). Don't expect a KFC-style experience when you order ayam goreng (Indonesian fried chicken) on the street or in any Padang restaurant throughout Indonesia. For starters, Indonesians use free-range chickens, so the cuts tend to be smaller but denser than the chickens you find in most American fast-food restaurants. Indonesian fried chicken is also cooked very differently. Instead of being deep-fried in vats of oil, ayam goreng is braised in a broth of spices in a process called ungkep; the liquid is allowed to evaporate over a low fire, leaving behind a fragrantly spicy meat dish that is then fried before serving. The royal city of Yogyakarta lays claim to serving the most flavorful fried chicken in Indonesia; "Ayam goreng Yogya is so iconic," a source tells food blogger Robyn Eckhardt, "that 'Yogya and Suharti [a popular ayam goreng restaurant in Jogjakarta] is like America and Kentucky Fried Chicken.'" Nowhere is the Chinese influence on Jakarta's street food most tangible than in the bakmi stalls in Jakarta's Glodok district (the city's unofficial Chinatown). The humble bakmi noodle was first introduced by Hokkien Chinese immigrants. Over the years, Indonesians have developed a taste for an almost infinite variety of bakmi-based dishes, from a simple bakmi ayam with broth, chopped chicken meat, and wonton; to bakmi goreng, a fried noodle preparation with chicken breast, broccoli, cabbage and mushrooms. Bakmi connoisseurs insist on springy, al dente bakmi noodles, served with ever-indispensable side condiments like fried shallot and sambal. You'll find hunks of meat roasted on bamboo skewers wherever you go in Southeast Asia, but Indonesia's saté (spelled elsewhere in the region as satay) is something else. It could be the peanut sauce: Indonesians incorporate shrimp paste into the mix, giving the whole thing an impressive umami kick you don't get with peanuts alone. In Madura - where the best sate ayam (chicken satay) is supposed to come from - the locals use a fish-based paste instead, subtly altering the flavor of the resulting sauce. If you're feeling adventurous, try other variants on saté - when buying the stuff on the street, you'll encounter saté made of goat, tofu, kidney, intestine, liver, and cubes of coagulated chicken blood.